Daddy weird, you guys. Daddy VERY weird. Well, this is it. The end of an era. The culmination of over 10 years of work. The very last Theater Hopper comic. Incidentally, it was Cami’s idea to bring the kids into the comic for the finale. I hadn’t considered it until she suggested it, but it was really the perfect way to end things. Henry turns 6 years-old in February. Pearl just turned 3 in early December. It’s been a conscious decision of mine not to include them in the comic, even though people have asked me for years to introduce them. Not to be selfish, but I didn’t want the comic to be about them. 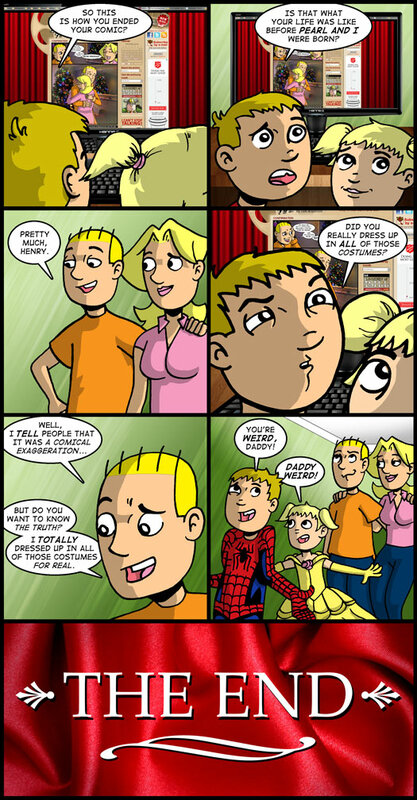 Ostensibly, when you introduce kids into the comic, it becomes a lot harder to place any focus on the adults without making them look self-obsessed at best, negligent at worst. But, hey! Now that the comic is done, I can through those rules out the window, right? It was also a little bit of fun to brush up against the 4th wall one last time. I’ve been wrestling with this blog post for a while. I’ve kicked around versions of it in my head for weeks, started and stopped it a million times. Drafted and redrafted looking for something to properly encapsulate what I’ve accomplished with the comic up until this point. Ultimately I decided to scrap that and speak from the heart. It’s served me well over the last 10 years. Why stop now? In nearly every interview I’ve ever given over the years, I’ve frequently been asked the same question: “Why did you start Theater Hopper?” It’s not a bad question. It gives the rest of the interview context. But I always cringed at answering it because I thought it let people know right off the bat that I was a complete fraud. A little pretext: You talk to some cartoonists and they talk about how drawing was ALL they ever wanted to do. They slugged it out for years drawing comics in their high school or college newspapers, fanzines and getting turned down again and again by the syndicates – never really finding success, but never giving up on the dream. Now, I’ve been an artist for as long as I can remember. I drew comics featuring my friends back in Junior High. But I never identified myself as “A CARTOONIST.” I was just a guy who liked to draw. Theater Hopper was almost entirely a fluke. At the time I created it back in 2002, I was trying to teach myself web design. I figured I would be more invested in this process if I had a site that required content and upkeep. Fast forward 10 years later and I’ve had one of the richest, most unbelievable experiences that I could never have possibly hoped for. I’ve met a lot of cool people through this comic. I’ve traveled the country visiting with them in person at conventions and I’ve traveled the world talking to with people online about it. Most importantly, I’ve learned a lot. I’ve broadened my horizons through relationships that I didn’t expect a comic about movies to cultivate for me. I learned a lot about what makes other people tick. I learned a lot about my own shortcomings. I see people better now than I used to. Maybe that’s a part of maturing. Maybe it’s inevitable for all of us. Certainly 35 year-old me is more wise than 25 year-old me. Just as 25 year-old me was better off than 15 year-old me. But I like to think Theater Hopper accelerated my understanding of the world a little bit. To that end, I want to take a moment to thank some of the people I’ve interacted with over the years who helped Theater Hopper become what it. If I’m leaving anyone out, please know that it’s not intentional. There’s just a lot of ground to cover in 10 years! CARRINGTON VANSTON – You’d think if you were starting a movie comic about movies that you would stop to look around the internet and see if anyone else came up with the same idea first. Well, as the last 10 years of this comic can attest, I am an idiot. It wasn’t until months after I had established Theater Hopper that I came across Carrington’s Movie Punks. I wrote him an e-mail and begged forgiveness – not knowing that it was permissible to have more than one web site on the internet covering the same field of discussion. Thankfully, he gave me his blessing. Without that, Theater Hopper would have been over before it even started. ZACH MILLER – After making amends with Carrington, I started to step out into the wider world of web comics. Zach Miller from No Pants Tuesday and Joe and Monkey was one of the first web comic friends I made. Zach was never shy about telling you his opinion and we ended up exhibiting at a lot of conventions together over the years. A great guy. MITCH CLEM – If I remember correctly, Mitch (most famously of Nothing Nice to Say) was already in Zach’s orbit by the time I met him. We all started our comics at roughly the same time, so it seemed reasonable that we could help each other out. Like Zach, Mitch and I would exhibit at conventions a few times over the years – even though it was never really his scene. That said, I have probably never laughed harder in my life than the times I got to hang out with Mitch Clem. You know the people in your life who you get along with instantly, absent any real knowledge of their background or personality? Mitch was one of those guys in my life. We just got each other’s humor really well… even if I did have a knack for annoying the crap out of him. GORDON McALPIN – Most people who read Theater Hopper probably read Gordon McAlpin’s Multiplex. It makes good sense. Both of our comics are about movies to an extent, so we just kind of fell into each other’s orbit. We solidified our association when we teamed up with Joe Dunn (more on him in a second) to form The Triple Feature podcast. Gordon has always been the pragmatic smartass pal that I’ve turned to bounce idea off of. Gordon has a real knack for storytelling and knows how to take a good idea and make it great. He’s always been an excellent friend and confidant. If I didn’t feel that way, I wouldn’t have turned Charlie and Jimmy over to his care. Look for them to show up in Multiplex in 2013! JOE DUNN – I know of no other artist more prolific, amazing and humble as Joe Dunn. A large collection of his work can be seen at Digital Pimp Online, but the guy has been everywhere the last few years. I consider him to be one of my main artistic inspirations. Much like Mitch Clem, Joe is one of those guys that I’ve been fortunate enough to just click with. We’ve shared a hell of a lot of laughs together. C2E2 in Chicago this year was my last convention. I’m not sad about leaving the insanity of the convention circuit behind. But I am sad that I won’t get to hang out with Joe Dunn again anytime soon. The man is awesome, sincere and a great friend. COMRADE F, DAVID BUIST, TYLER MARTIN, PHILIP HOFER – Each of these guys had a hand in developing the back-end systems that kept Theater Hopper up and running over the years. They were frequently the recipients of panicked e-mails when I had touched something on the server that I wasn’t supposed to touch. Their insights and service were invaluable to the growth of the site over the years and I appreciated each of them for their hard work. BRIAN ARNOLD – Much like the gentlemen listed before him, Brian was integral to the success of Theater Hopper behind the scenes. He provided hosting and support, coding knowledge and expertise and all around awesomeness. More than anyone else, I have leaned on Brian for his help and he has never asked for anything in return. As I’ve gotten to know him over the years, we’ve come to learn that we have had many similar experiences and share a philosophy about life that you don’t find too often in others. We joke that we are almost like brothers. The bottom line is that Theater Hopper could not have existed for as long as it did without him. THE THORUM – When Theater Hopper first started out, it has a forum community much like every other site did at the time because – hey – that’s what you did. Over the years, people came and went, but there was always a core group that kept the conversation lively and fluid. They came to christen our forum the “THourm,” and we were a happy little family. As the site began to grow, I was unable to dedicate as much time as I had previously to the community. To be completely honest, I flaked out. When the THorum was attacked by a particularly nasty hack, it pretty much ended things for good. I tried to reignite the THorum a couple of times later on, but the spark wasn’t quite there. By that time, social media had come along and online conversations started happening in different places. However, there are still people from that core group that I talk to almost every day. People like MadMup, Andelyn Harrison, Frogglin, bd, JClark, Meags, ADSquirrel, abe, Angela Elmore, Bishma, Scootles, Charley and more. If I’m forgetting any of you, please forgive me. I’m trying to keep a lot of names straight in my head right now! The point is, these are the people who first came to support Theater Hopper and they are people I still talk to a decade later. I feel very fortunate for that. If I could give each one of them a Golden Danza, I would. I know that means nothing to the rest of you, but that’s kind of the idea. MY FAMILY – This kind of goes without saying, but what kind of monster would I be if I didn’t thank my wife Cami and our two beautiful children Henry and Pearl for supporting my dream the last 10 years? The extraordinary late nights, the groggy mornings, they frayed patience and short tempers. The sacrifices I made pursuing this dream were very real to my family. I think it would be over-dramatic to say they suffered for it, but it wasn’t always fun. Especially those long weekends away when I was at some far-flung convention. Now that it’s done, I feel confident that I’ve created a body of work that does them justice. I know that I’ve accomplished something real when my 5 year-old son Henry looks over my shoulder at the comics I’ve drawn and starts to create his own comic strips. He has a love for art that I’m not sure I had cultivated they way he has at such and early age – and I can’t wait to see where that takes him. Cami, in particular, deserves a lot of credit. She’s been my sounding board when I’ve been frustrated or dejected. She’s been patient and understand when she really didn’t have to be either of those things. She saw what Theater Hopper meant to me and gave me support. I’m beyond lucky to be married to her and make every effort to tell her that often. I only hope she realizes how deep my well of appreciation and love for her actually goes. Since announcing that I was ending Theater Hopper in January, several people have written to me and asked me what’s next. I should say first of all that – just because I’m ending the comic – doesn’t mean I’m going away completely. I’ve been online too long now to quit cold turkey, so you can find me in all of my usual haunts. Drop me a line on Twitter at https://twitter.com/tombrazelton. I’m always down for a little conversation. You can also stay up-to-date on what I’m working on by checking out the Theater Hopper Facebook page at https://www.facebook.com/theaterhopper. Yeah, I know it doesn’t make a lot of sense to maintain a Facebook page for a comic that doesn’t update anymore, but I’ve got a good thing going there. Over the last couple of months, I’ve been transitioning the page as a hub for me to share cool movie-related things I find. Whether that be the occasional picture or an article about the state of Hollywood that I have to comment on, you can find it there. Every now and again, I throw an old Theater Hopper comic from the archive into the mix to keep things interesting. I update there pretty frequently, so if you aren’t following the page already, now is a good time to check it out. And, of course, you can always e-mail me at theaterhopper@hotmail.com. All of my e-mails are being forwarded to one account these days, so I see everything still being sent there. One of my greatest accomplishments with Theater Hopper in the last 10 years is fundraising and producing three print collections of my work. Theater Hopper Year One, Two and Three were great experiences for me and I really appreciate the people who helped support my dream of seeing Theater Hopper in print. By my work is not done. Now that the comic is over, I’m shifting my sights to producing SEVEN NEW BOOKS – Theater Hopper Year Four through Ten. The only hiccup is this: Since I’m not producing the comic anymore and I won’t be going to conventions to sell them, producing printed editions is out of the question. So where do I turn? I’ve decided instead to produce the new material as eBooks. The up front costs are lower, the storage problem is no existent and I can sell them in perpetuity on an as-needed basis. The books will be very much like the print edition. Each comic from each year will be presented along with commentary. So the books will provide readers with unique insights into the history of Theater Hopper and how I developed the comic. You’ll learn what jokes work, what strips bombed and what I learned along the way. Since I don’t have a lot of experience producing eBooks, I plan on turning the production over to a company called Graphicly. They’ll be able to take my spreads and convert them into practically ever eBook format known to man. These books will work on the Kindle Fire, iPhone + iPad, NOOK Color, NOOK Tablet, NOOK Touch, Android Tablets, Android Phones and the Kobo VOX Reader. Turning production over to Graphicly will allow me to focus on the content and produce books faster. Of course there is a cost associated with this service and that is why I am crowdfunding through Kickstarter. You guys might remember that I raised funds for Theater Hopper – Year Three through Kickstarter and we made goal. I needed $3,500 to produce a print run of 500 books. For the Theater Hopper eBooks, I’m asking for $3,000 to pay for the production of SEVEN NEW BOOKS. I think that’s a far better deal, don’t you? Check out the campaign here: http://www.kickstarter.com/projects/tombrazelton/theater-hopper-ebooks. Watch the video, listen to my pitch, read the story about the project and check out the rewards. Once the project goes live, I’ll update the campaign page with information each week. I’ll also be posting updates to my Twitter and Facebook accounts, so that’s another way you can stay up-to-date. I think this goal is very reasonable and – with your help – we can make short work of it. Once completed, it will help to ensure that Theater Hopper can be enjoyed by existing fans and potential new fans that haven’t even discovered the comic yet. It’s a way for the comic to live on. I’ll add here (only because others have asked about it) that it is my plan to keep this site up and running, fully in tact, until I am unable to afford hosting. Hopefully that will be a very long time. So if you ever want to come back and visit the archives, they’ll be here for you. I’ve kept this pretty close to the vest, but I DO have a new project that I will be working on in the future. It’s called MIDWESTERN NICE. Click that link and you can visit the new site. What is Midwestern Nice? I can’t go into details other than it will be a very personal project and I think you guys will like it. But the time isn’t right to unveil it right now. Instead, what I think is best at the moment is for me to decompress a little bit, hopefully start working on the Theater Hopper eBooks in the near future and then reveal Midwestern Nice when I have it set up exactly as I like it. Sign up for the mailing list and I will keep you up to date on all news related to my new project. I won’t be hitting you with a ton of e-mails, so you don’t have to worry about it right away. But it’s a good way to stay connected. I’d like to thank everyone who has visited the site in the last 10 years, who has offered criticism and feedback and who has taken the time to share their thoughts and ideas with me. It has not gone unnoticed and I have made every effort to engage with you where I could. I’ve been the richer for it. I think I’m at a point where the full reality of ending Theater Hopper hasn’t sunk in – despite the fact that I gave myself a year to make peace with it. But I know – should I go off the deep in in a few weeks from despair and regret – you guys will still be out there and I’ll calm down a little bit. Like I said, I won’t be going too far. But for now, this is… the end. So this is how you ended your comic? Is that what your life was like before Pearl and I were born? Did you really dress up in ALL of those costumes? I TOTALLY dressed up in all of those costumes for real.